The Turning Basin Terminal fender replacement at Wharf 16 was part of a $25 million Port of Houston improvement project. 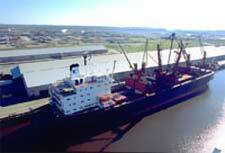 Each year, over 2,800 ships and barges use this convenient terminal to move products all over the world. A Houston civil contractor was awarded the job to remove and replace the deteriorating fenders at this wharf. Portland Bolt provided galvanized timber bolts and shear plates for this customer. The plans required a custom slot to be machined into the round head, to allow easy installation in the field. Our large inventory of shear plates and ability to manufacture galvanized timber bolts in-house, allowed us to deliver this product quickly to the Gulf Coast region.